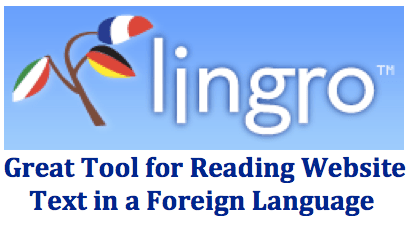 Lingro.com: No need to look up words in the dictionary or with an online translator with this useful translation website. Enter a website address and you’ll be taken to a Lingro supported version of the page where every word is clickable. Click on a word to see its definition. There are 11 languages available with translation available between each of the individual languages. There are even ways to track the words that you click to check yourself after reading the page in the foreign language. This entry was posted in Reading, Technology. Bookmark the permalink.